Though the Burlington Municipal Band was funded by the City of Burlington for more than eighty years it now depends on private donations. The Burlington Municipal Band Foundation was created to encourage and manage these donations for the sole purpose of continuing the free, public concerts of the Burlington Municipal Band. The Foundation is a non-profit organization and has 501 (c) (3) status, meaning that contributions are tax-deductible. If you believe as we do that keeping the Burlington Municipal Band alive and well is important for our community, we ask that you consider making a financial gift to the Burlington Municipal Band Foundation. With your permission, your gift will be recognized on our printed programs and on our website. We also suggest that you consider making a memorial or honorary gift. 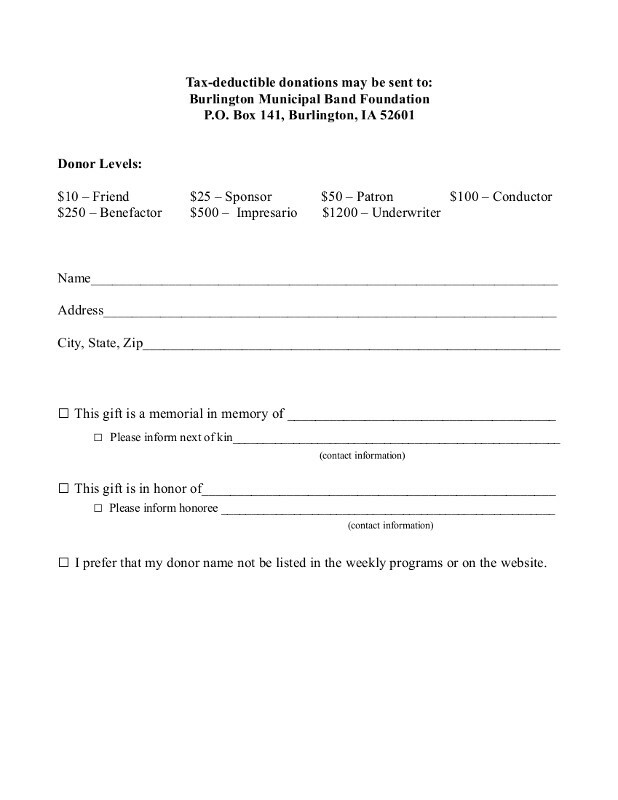 You can make a gift supporting the Burlington Municipal Band in memory or honor of a relative, a friend or someone who has had an important role in your life Making an honorary or memorial gift is a generous and thoughtful way to recognize a person's life and accomplishments. When you make an honorary or memorial gift, the Burlington Municipal Band Foundation will (if requested) notify the honoree or next of kin, and will (with your permission) gratefully acknowledge the gift on our printed programs and on our website. To view a list of the Friends of the Burlington Municipal Band click here. To visit the memorial page, click here. To contribute, please click on the music note below to download a PDF file of this form which you can then print, fill out. and mail to the Foundation. at (319) 752-7305, or email jameprie1@mchsi.com.